The Canon Rebel T7 replaces the Rebel T6 as Canon's least expensive SLR digital camera. While the T7 is almost identical to the T6, Canon has increase the image resolution from 18 to 24 megapixels. All of the Rebel T7 systems include a Canon 18-55mm recreational lens. Built-in Wi-Fi is a very nice addition to the T7 but it doesn't work the way that most dental offices would like. You can use your smartphone, tablet or computer to view images on the camera's memory card and you can also control the camera using one of these devices as a live view remote. You can also transfer images once they have been captured on the memory card, but the camera will not automatically transfer the images to a device. Nissin's MF18 macro flash is the first flash option for E-TTL flash control on the T7. The MF18 is very similar to the Canon MR-14EX macro flash in that it is also a dual tube flash that is shaped like a ring. Each side of the flash has two possible positions: in next to the lens or each side can expand slightly out to the side. There are four lens options for the T7: the Tokina 100mm macro lens (18oz. ), the Canon EF-S 60mm macro lens (11.5oz. ), the Canon EF 100mm macro lens (20.5oz.) and the Canon EF 100mm L macro lens (22oz.). All four lenses offer very similar optical quality while the Canon EF 100mm L macro lens adds Canon's Image Stabilization (IS) system. The IS system makes focusing easier - a sophisticated system measures movement and counteracts the movement by shifting lens elements. If you are taking a mirror shot and you have the mirror in one hand and the camera in the other, you will be amazed how much more stable the image is in the viewfinder. The Canon EF-S 60mm macro lens is recommended for orthodontic offices as most ortho practices take a specific series of photos: portraits along with anterior, buccal and occlusal intraoral views. The working distance (the distance from the lens to the subject being photographed) with the 60mm is less than the 100mm and 105mm lenses which makes taking ortho views easier. For all other dental practices, a 100mm macro lens is recommended to allow shooting smaller fields, especially in the posterior. These lenses have enough working distance to allow 1:1 closeup magnifications anywhere in the mouth. If you have any questions about which lens is best for your needs, please call us. 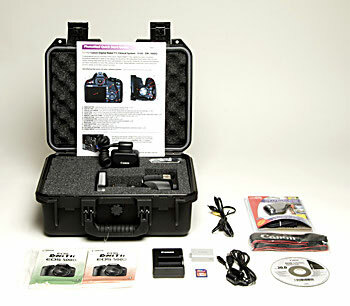 Complete systems (camera, lens and flash) also include a 16GB memory card, USB memory card reader and a professional grade hard case. The case is designed to hold the camera completely assembled and well protected. The complete camera system is pre-assembled and tested. It is shipped to you in a professional hard case with custom PhotoMed instructions for clinical use. The complete system also includes unlimited telephone/email technical support and loan equipment support if anything ever needs repair (Continental U.S. only). Unlike other sources, we never charge for tech support or loan equipment (except shipping charges). Accessories are too numerous to list here. PhotoMed carries everything you might need for your Rebel T7: memory cards, memory card readers, recreational lenses, etc. Give us a call and we'll help you decide which accessories will work best for you. There are two flash choices and four lens choices for your Canon Rebel T7 System - use the grid below to determine the price of your system. All of the Rebel T7 systems include a Canon 18-55mm recreational lens. Please call or email us if you have any questions regarding lens and flash configuration. 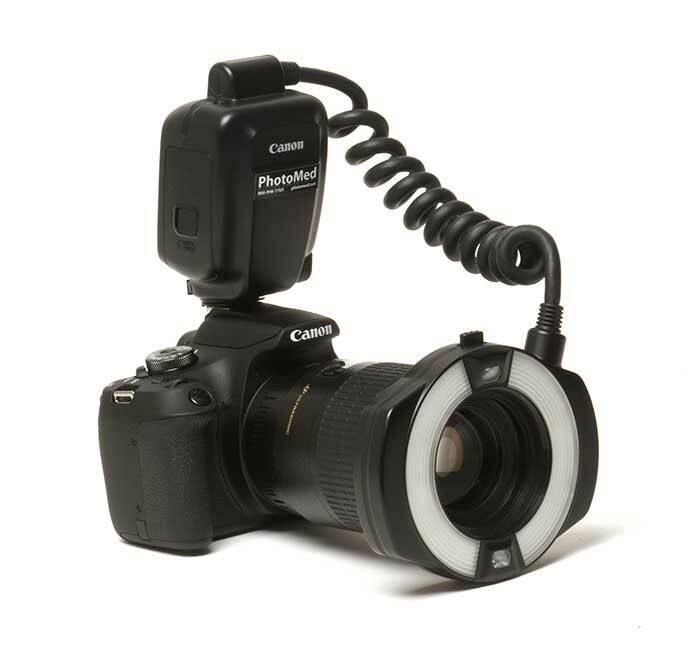 Listed below are popular accessories for the Canon Rebel T7. Please call or email us if you have any questions regarding options or accessories.